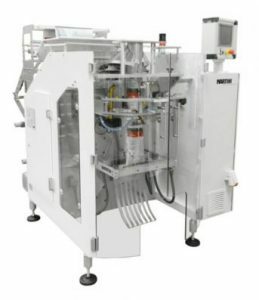 Martini srl presents MBM600 a “box motion” continuous vertical packaging machine, the result of the constant technological innovation that celebrates us. The particular independent movement of the sealing devices provides total control both of the vertical and horizontal axes, thus optimizing the working times. Not only that. It is possible to program the closing time of the horizontal jaws in order to obtain optimal seals without changing the temperature and without losing speed. To complete the already wide range of accessories, we have developed a special device for the production of four seals packages thanks to the forming device integration, decreasing changeover times and avoiding any new calibration. Vertical movement of the horizontal jaws controlled by a linear motor. Opening and closing movement of the horizontal jaws by brushless motor. Vertical sealing group by means of an easily replaceable sealing belt. Gravity device for the film tensioning with pneumatic spring, controlled by a linear transducer, complete of stroke end photocells. Automatic motorized lateral film centering, driven by two optical fibres which detect its position. A machine automatic stop device with magnetic sensor, activated if the film reel ends.